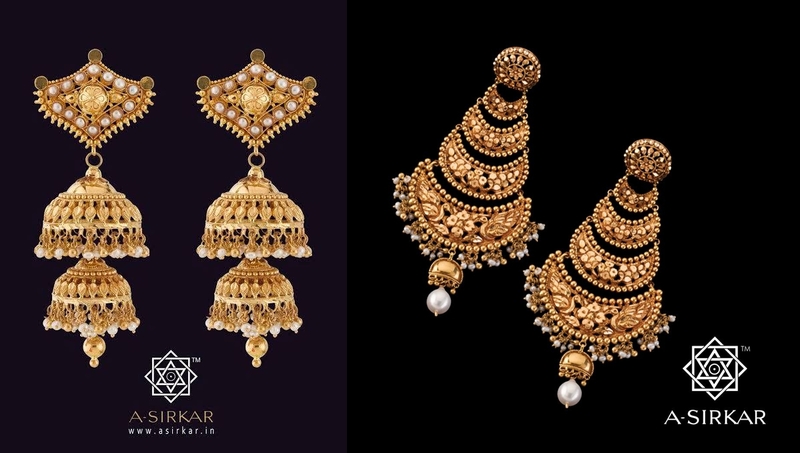 Starting from the crowning glory, the Taira and Tikli would always rule a Bengali bride’s jewel assemble. 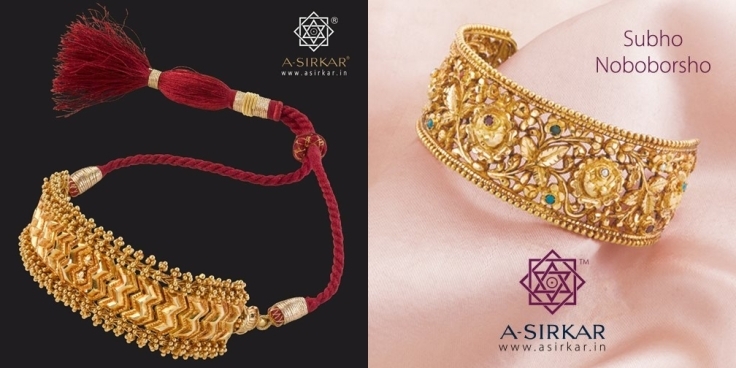 The “tikli” or maangtikka, used for a traditional Bengali bridal look is generally not a kundan one. 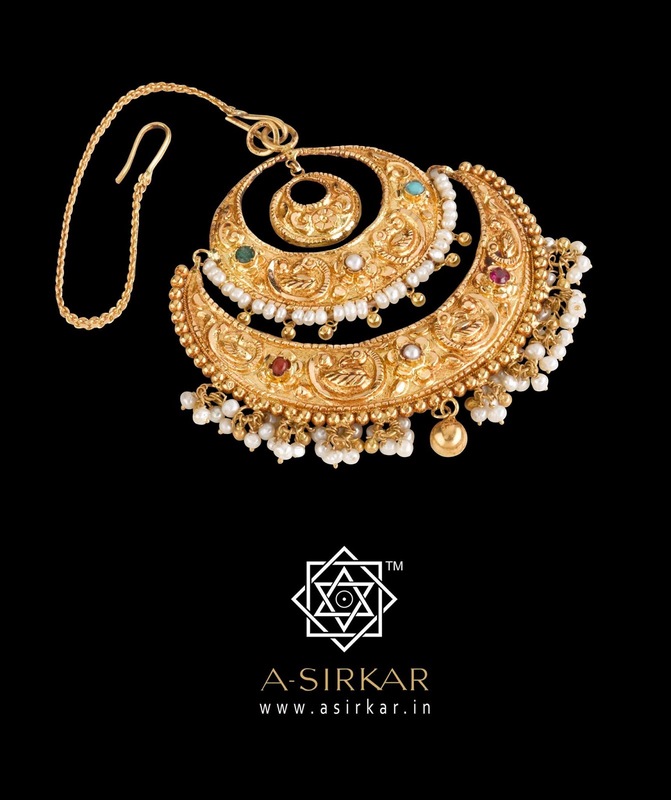 It is something with intricate gold designs like this one! 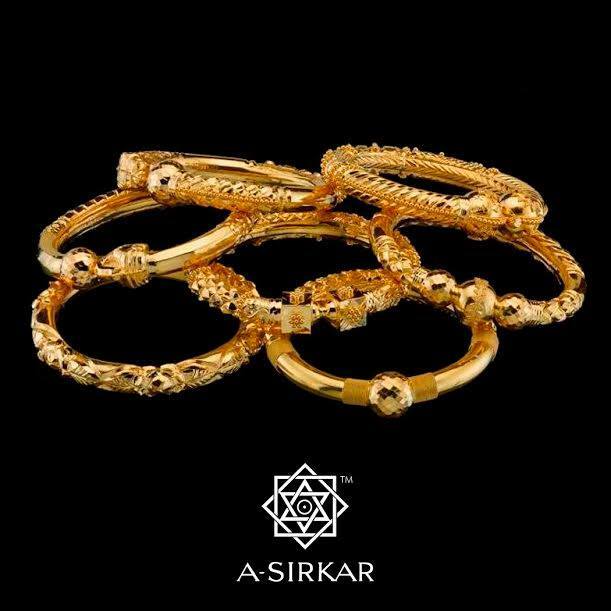 I am bowled over by this design by A. Sirkar. Loving the white rice pearls dangling below. 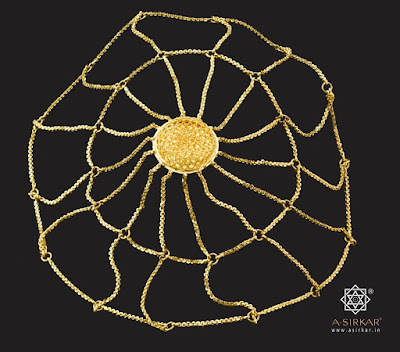 The “taira” is essentially a horizontal chain-like ornament (often stuck to the “Tikli”) which was originally used to hold the “orna” over the bride’s head. The Bengali bridal “orna”, unlike the heavy embellised dupattas of rest of India, is made of tulle or tissue fabric. 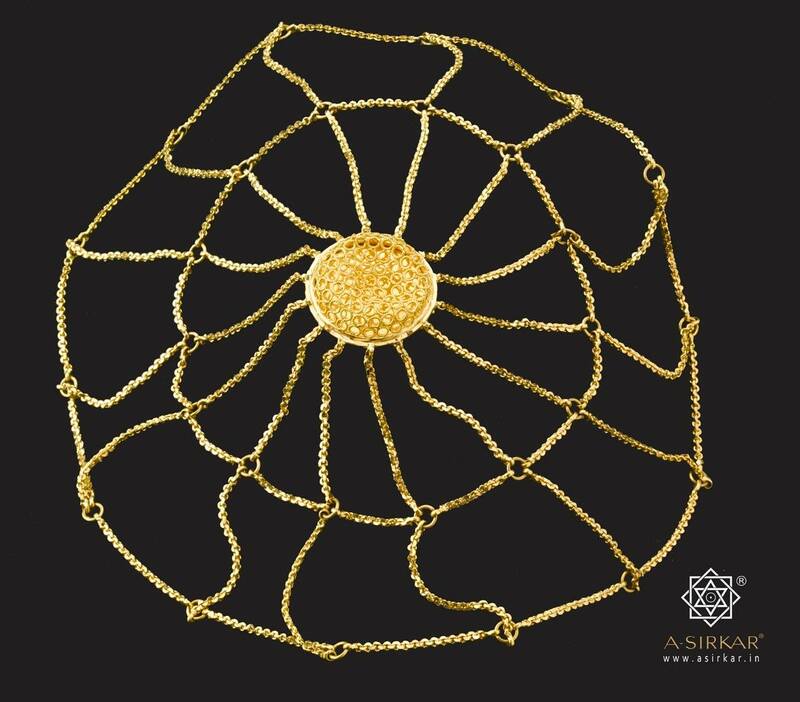 To hold these lightweight veils, a taira comes in handy :) This one is from Google images. 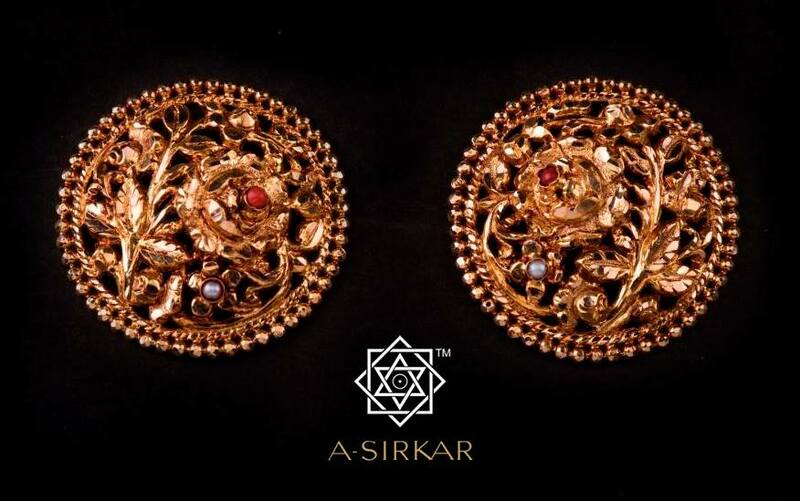 The traditional Bengali ear ornaments include Jhumka, Kaan Jhumka (Ear cuffs with jhumkas), kaan baala (Shaped like the commonly known chandbaali), Paasha (oversized studs) etc :)Take a look at these stunning designs by A.Sirkar & Co. Jewellers again! Complete gold jhumkas for that heavy zari “laal benaroshi” or the meenakari jhumka for the colorful sarees worn in reception party! 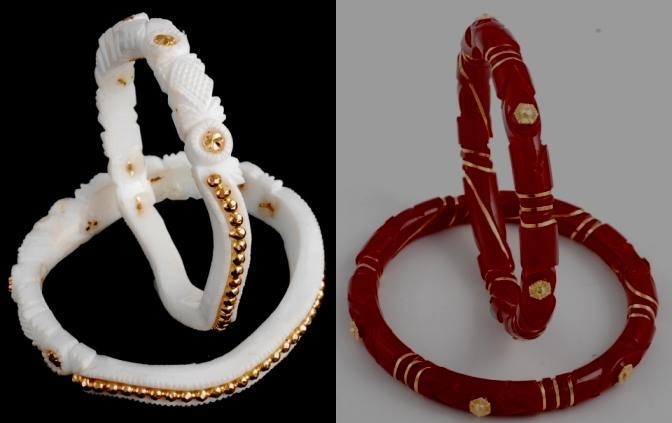 Tired of wearing heavy jewellery? 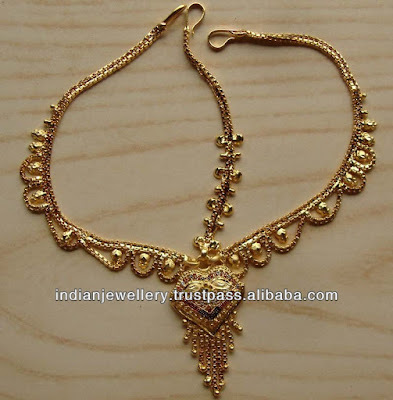 How about these exotic rose-shaped kaan-pasha which you can wear on the functions pre and post wedding? 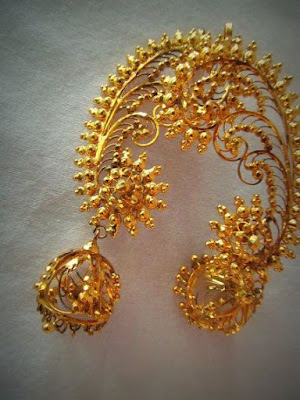 Bengali brides were known to wear large gold nose rings. 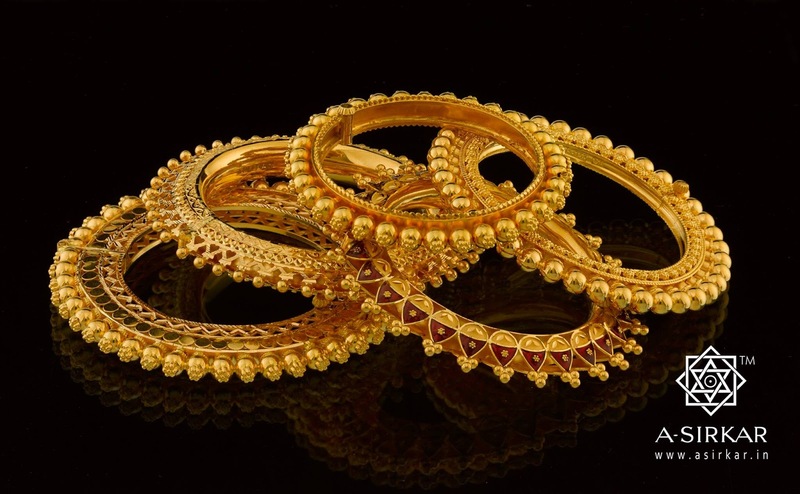 The legend goes, the larger the ring, the more “genteel” family the bride belonged to! Sadly, most of us do not have nose piercings these days and end up wearing smaller nose rings (or worse! No nose ring at all). 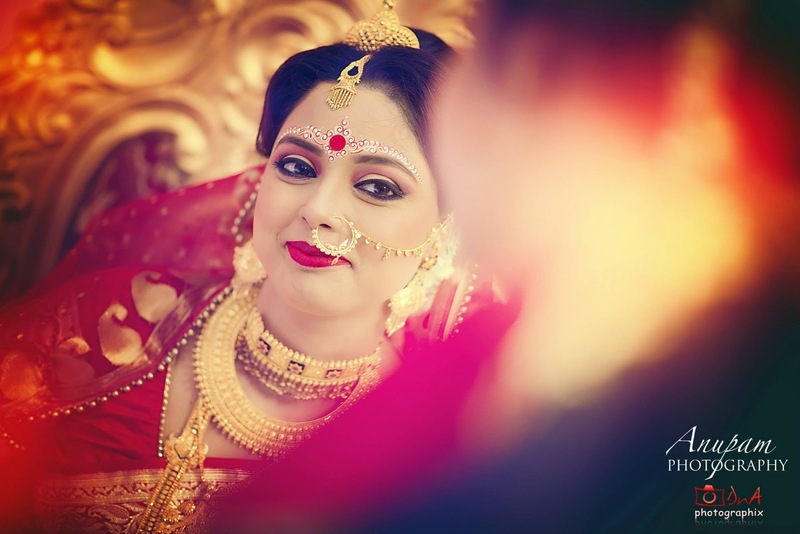 There is something about a Bengali bride, a huge golden ring and red bindi which instantly gives a goddess like look to her J I am wearing one huge one for my day ;) For now, check these awesome bridal pics by DnA Photographix for some Nauth designs.These will give you an idea! Again, the most eye-catching pieces of jewellery a bride wears is definitely the necklace. Bengalis have many kinds of traditional bridal necklaces crafted out of gold. The craftmanship of these beauties will make you go weak in the knees. 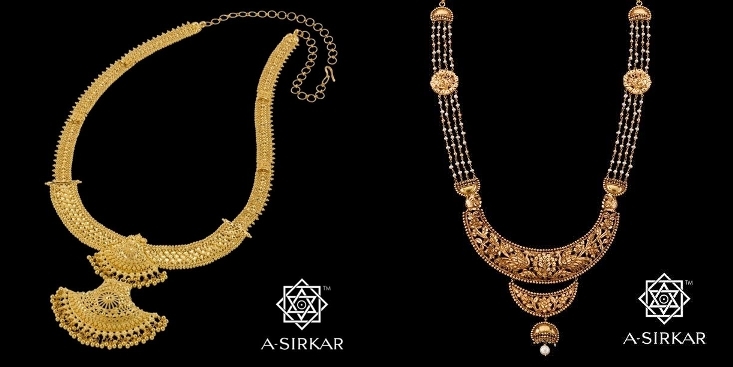 The paati haar (flat designed necklaces which delicately sits on the neck), Cheek (or choker: the inch-wide neckalce with intricate designs to be worn as a collar), Sita Haar or Rani haar (The long ROYAL necklaces) etc form just a few of the myriad designs. 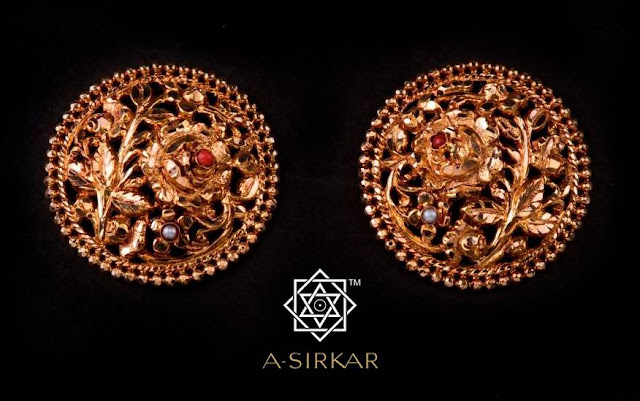 Take a look at A.Sirkar’s fabulous craftmanship. Ahem! Back to earth? 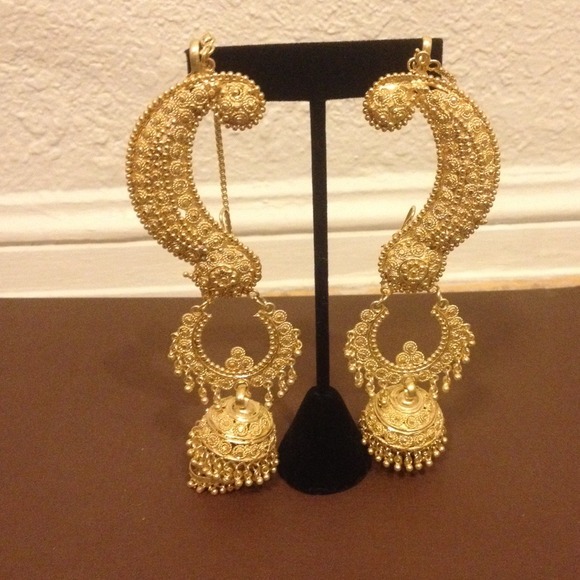 :D So now tell me, have I managed to stir up the forgotten love for Bengali jewellery again? 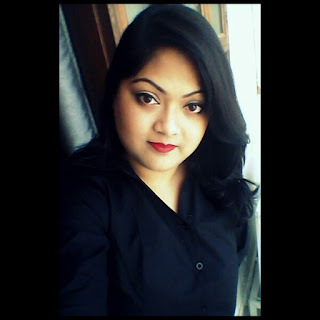 If yes, stop being a “me-too” and take pride in being the regal Bengali bride <3 See ya next time! 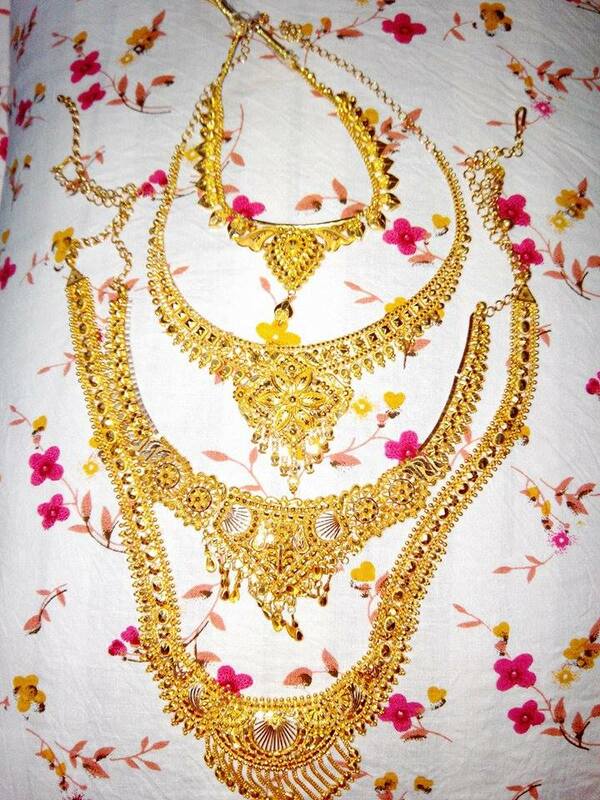 A very close friend of mine recently got married and this is her Necklace collection :D Wonderful, isn't it? The Shaada-Laal Paar Sharee (White saree with red border) also brings out the quintessential beauty of a Bengali bride. Here is another pic for you all from A.Sirkar & Co. Jewellers which portrays the bride in full regalia! The jewels she is wearing are : Kaan baala, Choker, kamarbandh, Golap Phool pata baala (Bangles with rose leaves pattern), jhooro choori (delicately carved bangles), Shakha-Paula, Nauth, oporhaath (bajubandh) and last but DEFINITELY not the least, chaabir chhora or the gold key chain (how could I forget this!) :D Enjoy! Keep coming back to this section for more! 2. Mehendi or Alta: What is your choice?